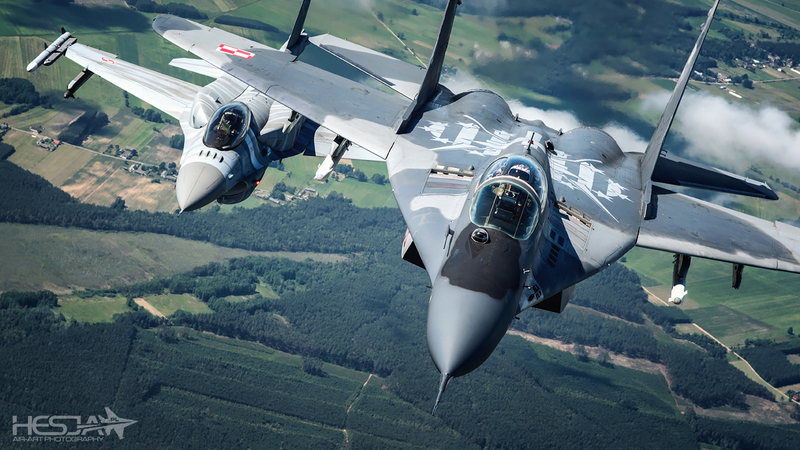 We have the Feast of the Polish Armed Forces today! It is a warm morning on Jun. 22nd 2016. CASA C-295 aircraft is landing at the 31st Air Base in Krzesiny. This is the aircraft that is about to take us to an aviation photography paradise. I know the plan now! 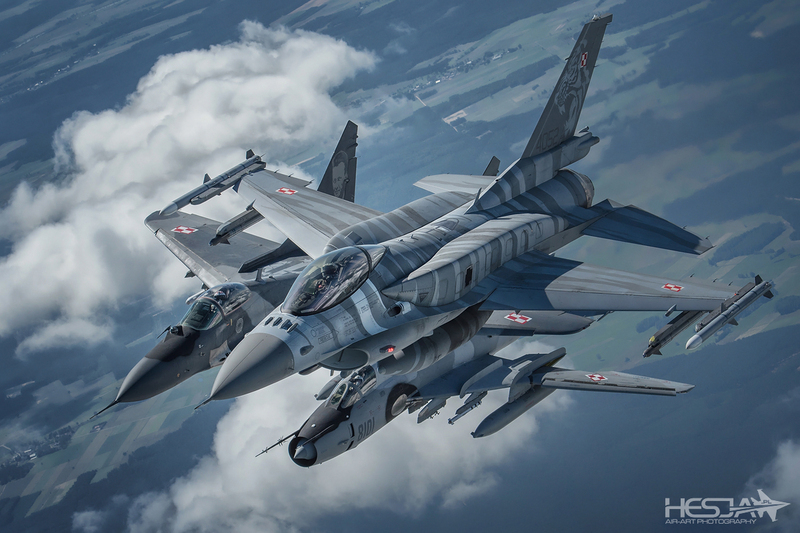 Two sorties are going to take place, the goal of which is to carry out an Air-to-Air photo shoot involving the Polish Air Force aircraft. 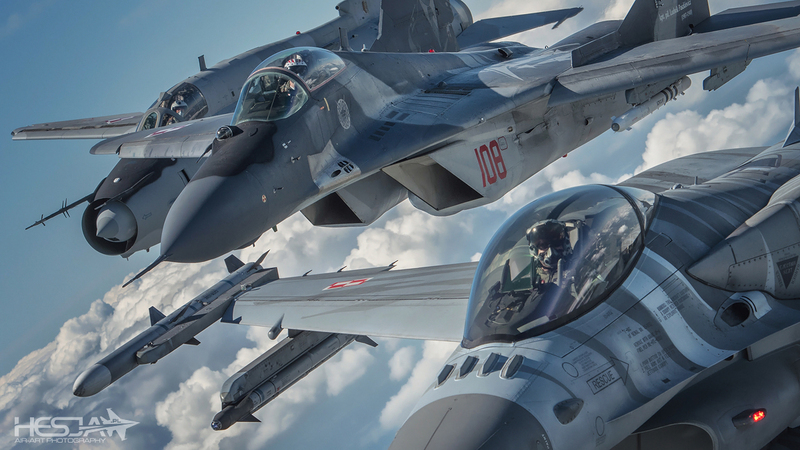 During the first flight, Su-22, MiG-29 and F-16 jets are going to act as our models. 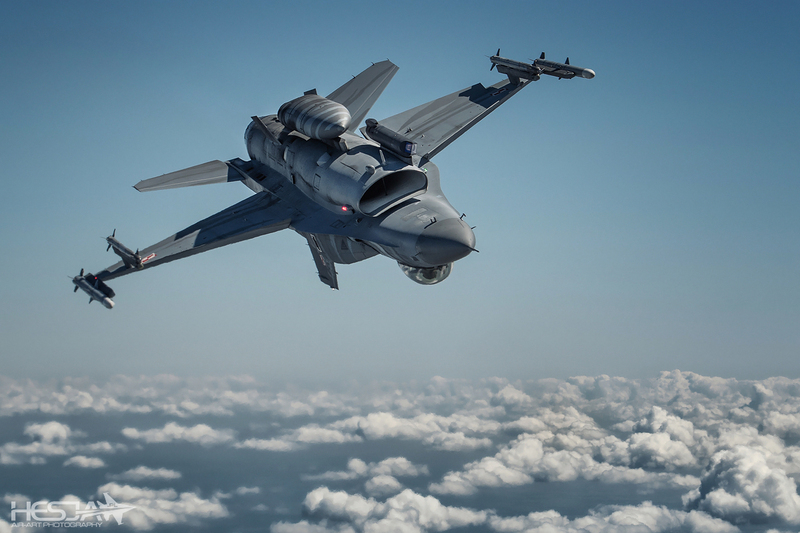 The second flight is a photo-shoot concerning the F-16’s 10th Anniversary (anniversary of being introduced into service). 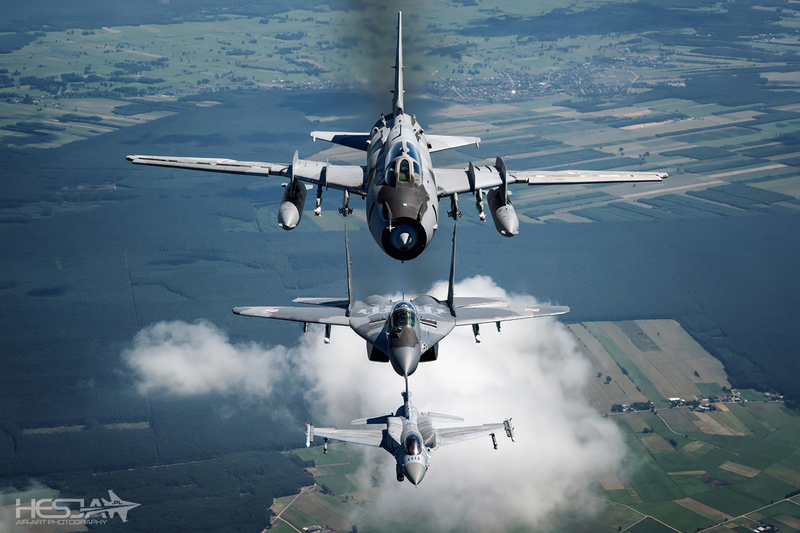 We are to be accompanied by four beautiful and slick F-16 fighters! This is the plan. To what extent we are going to be able to execute it? We’ll see. My experience suggests that something may not go according to the arrangements made. Plan is a plan, I am still reserved and cannot believe anything that happens. I cannot believe that in a few moments I will be able to take photos of formations of aircraft which are so unique! 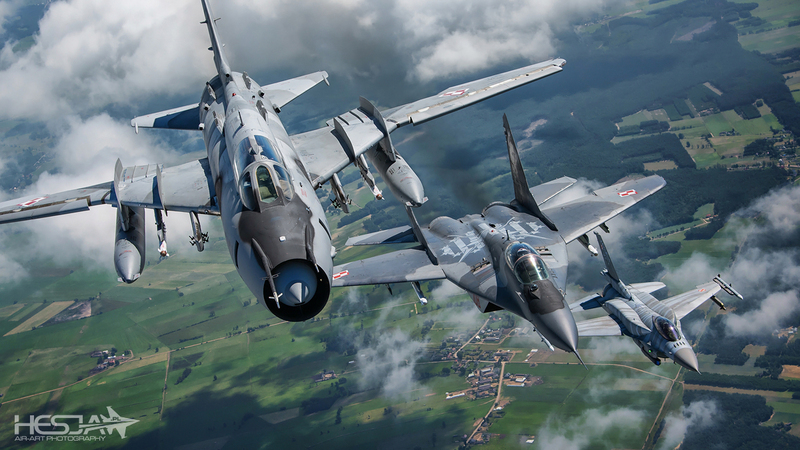 I cannot believe that, in line with the law, and without any special arrangements, I am going to be able to photograph our Polish jets, from our Polish aircraft, flying over Poland! 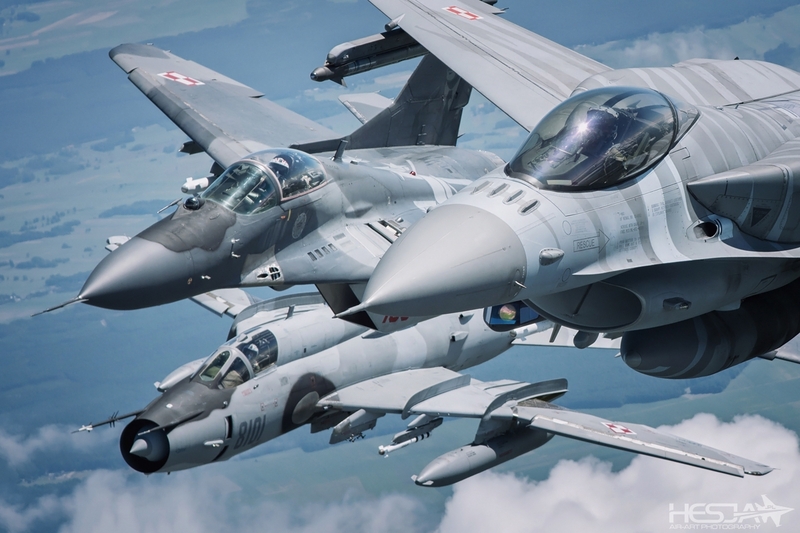 Up until now, when any shots of the Polish aircraft were published somewhere, they have often been a result of thousands of arrangements, often implemented in a very dodgy way. This time – from the very beginning, we have a full endorsement and approval on the part of the Command! This seems like a fairy-tale – I am still waiting for somebody to pinch me and shout: hesja – wake up! Stop the train of thoughts! We receive a signal to get ready for the photo-shoot. We approach the ramp which is still closed at that moment, and attach our safety harnesses to the hooking points we have arranged earlier. After one minute we are fully ready. Crouching, we are waiting for the ramp to open, as if we were waiting for a theatrical spectacle to begin. Blinking red light is a signal that the ramp began to open. As the light turns on, it gets brighter and brighter. The ramp opens as if it was a theatrical stage curtain, and what’s beyond? Beyond the ramp, we see one actress, waiting for her audience. A beautiful, majestic MiG-29 fighter, with the pilot working his throttle, which is visible as black smoke trails behind the jet! Even though I have gained some experience when it comes to the air-to-air photo shoots, the view I witness is breathtaking. A mighty aircraft, hanging right behind us, balancing on a cushion of air up and down. Everything is so unreal and incredible, so amazingly three-dimensional. 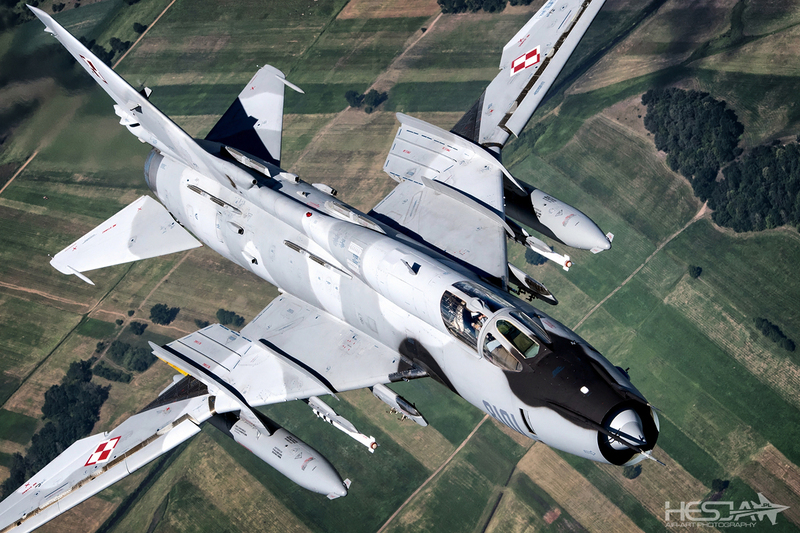 I notice a familiar white-red helmet in the MiG’s cockpit, belonging to “Kuman” (Lt. Col. Piotr Iwaszko) who greets us waving his hand. The MiG-29 is not the only actor on the stage though. 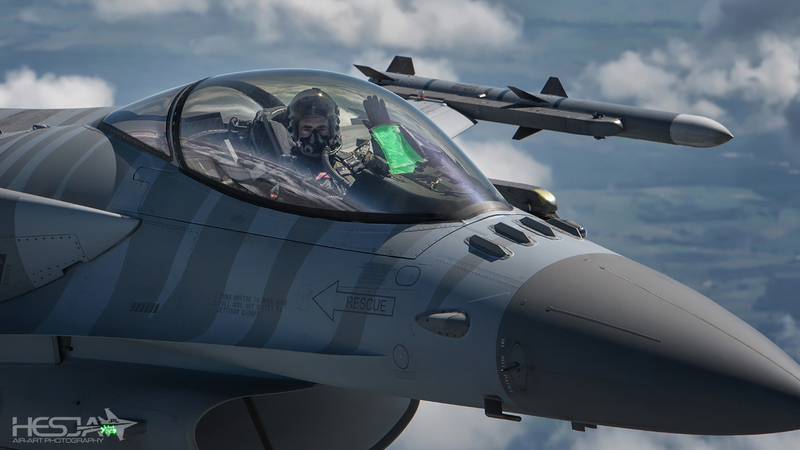 A few moments later, a Krzesinian F-16C jet joins us, with conformal fuel tanks, wearing a tiger paint scheme. 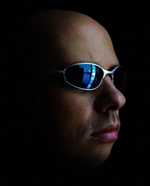 It is piloted by “Monk” (Lt. Col. Adam Kalinowski). The main problem evident during the air-to-air photo shoots stems from the fact that our platform is completely unstable. Besides the standard vibration of the airframe, we also witness turbulence which makes it harder to capture a sharp, non-blurry shot. Thus, it is very important to properly select the camera settings: shutter speed, aperture, VR mode and ISO sensitivity. The pilots are forming up and posing for the photos, but...wait! Where is the Su-22? It is a pity that the Fitter did not join us for some reason. I am shooting our two models, and then I notice some bright spot on the horizon. So, there the Su-22 is! 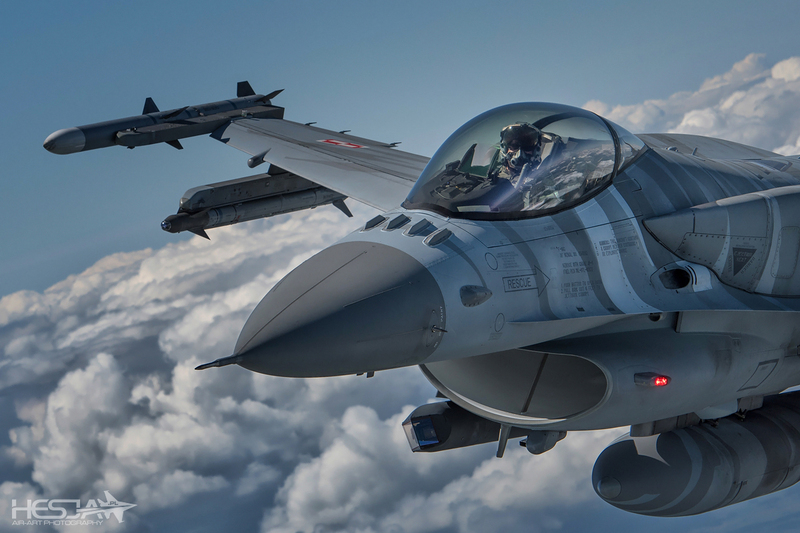 A bit late – as it turned out later, the ATC did not want to allow the jet to fly through the zone within which the F-16 fighters were operating at high altitudes. The Sukhoi is with us, welcoming us flying right behind the ramp. 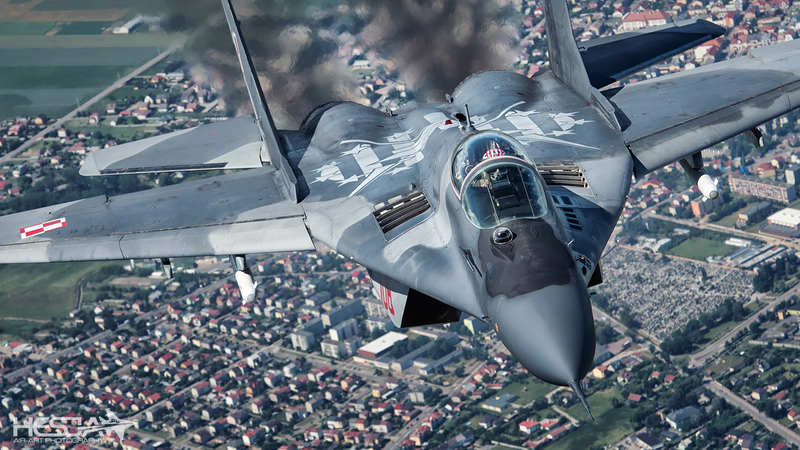 It is being piloted by “Qrik” (Lt. Col. Piotr Kurzyk). What a view! What an excitement! 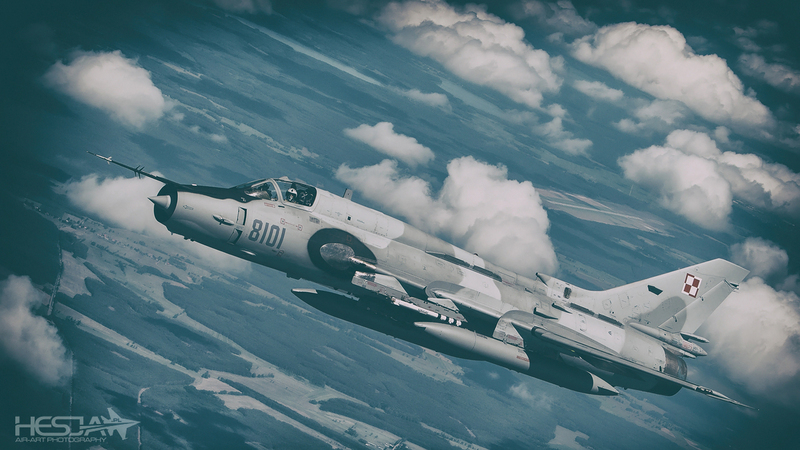 Especially when it comes to the Su-22, which, captured in the air, is a true rarity! 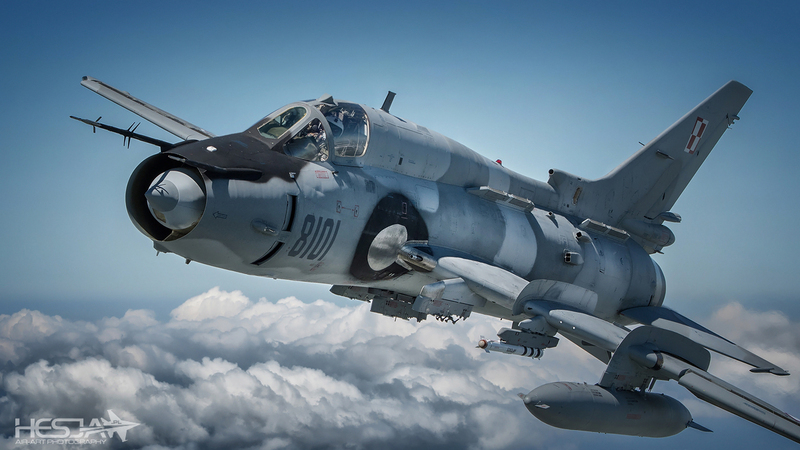 This stems from the stall speed of the Su-22 which is higher than the top speed of many popular airframes used as photo-ships for the air-to-air photo shoots. The CASA aircraft is perfect for the task, since even with its ramp wide open it is still able to fly at a speed which is quite high. So, the full squad is with us. 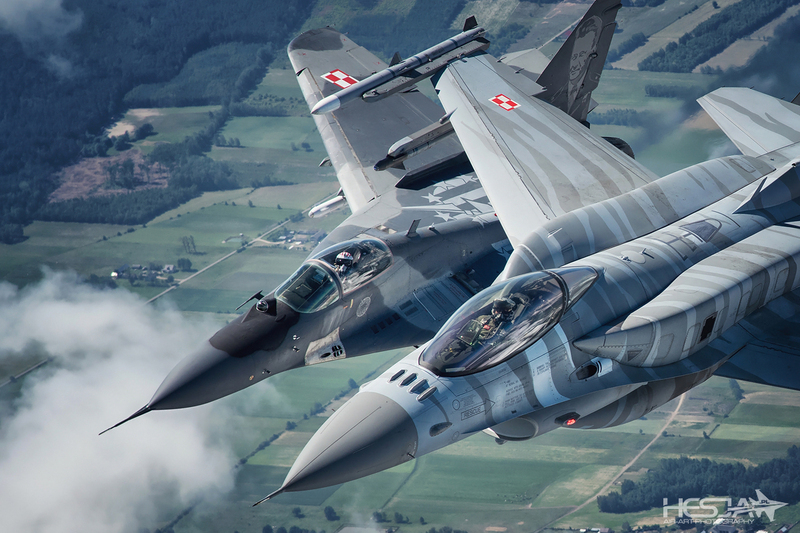 Three amazing pilots and three beautiful designs representing the Polish Air Force! Thus, we may proceed and start the maneuvering sequence arranged earlier. 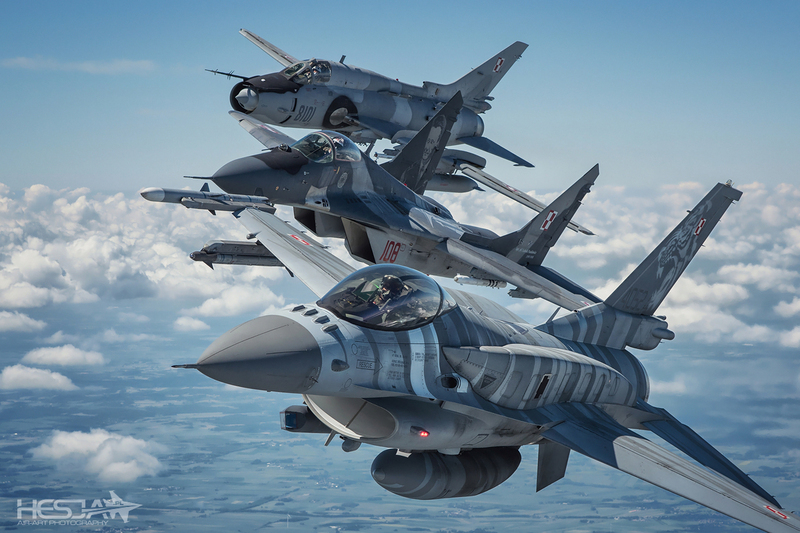 Despite the modern vibe brought in by the F-16, despite the might of the MiG-29, the Su-22 jet takes the formation lead role at the beginning of the shoot. Our “veteran” deserves it! Everything looks stunning. 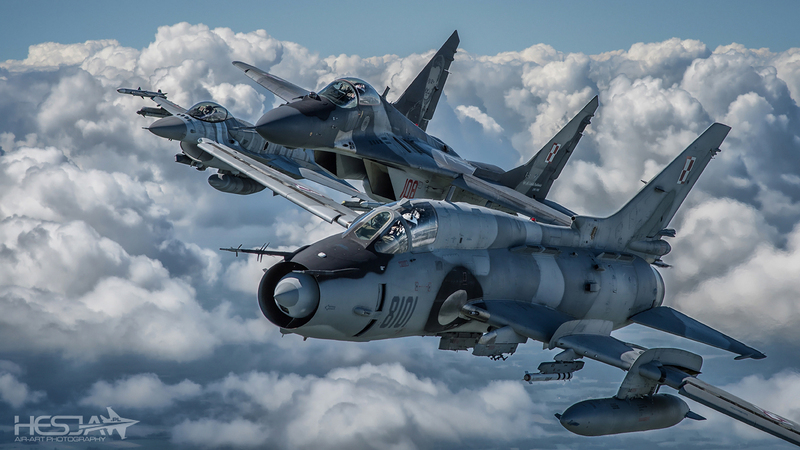 Su-22 leading a formation which changes its layout continuously. 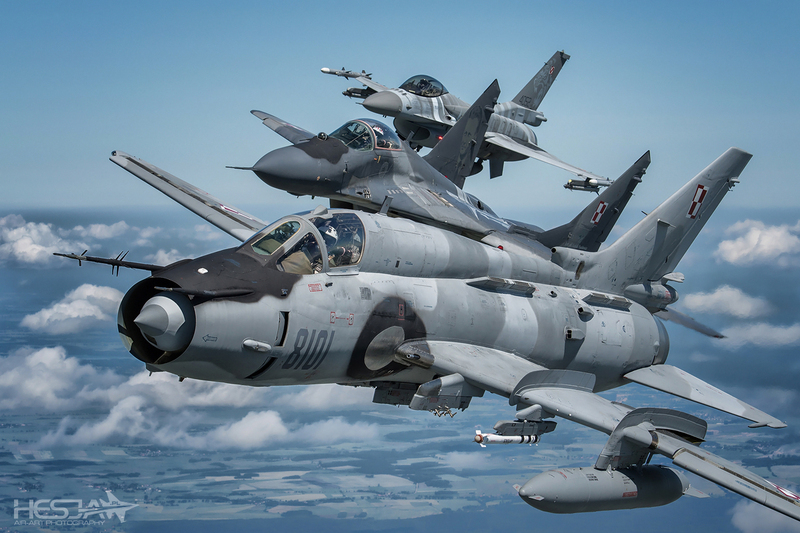 Not only is the arrangement of the aircraft is being changed constantly due to the plan made during the briefing, but also because it is very difficult to have three different airframes flying at the same speed, same angle and same altitude at the same time, in the air which is so rough. At this very moment, I am thinking about the pilots of the aerobatic teams, realizing how much work is needed for a joint, tight formation flight. 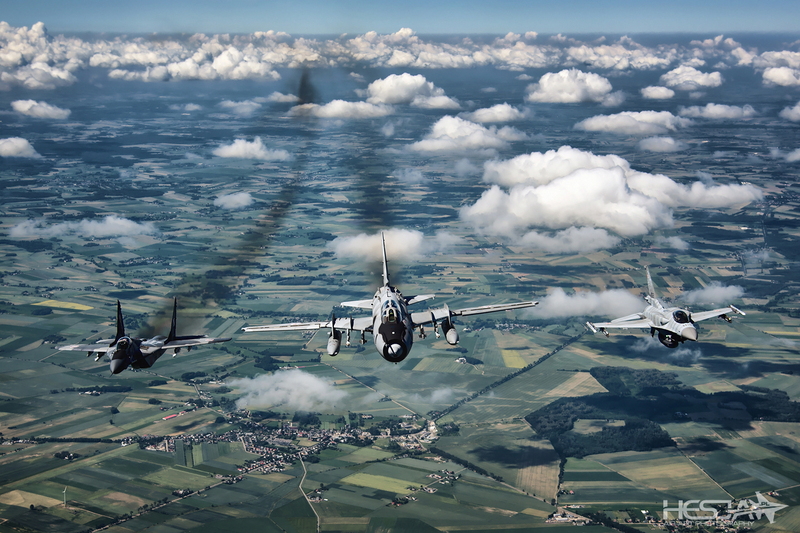 The variability of positions makes it difficult to take a shot, on which all of the three jets are positioned in one line. We are having a lot of fun. Now, the F-16 takes the lead. 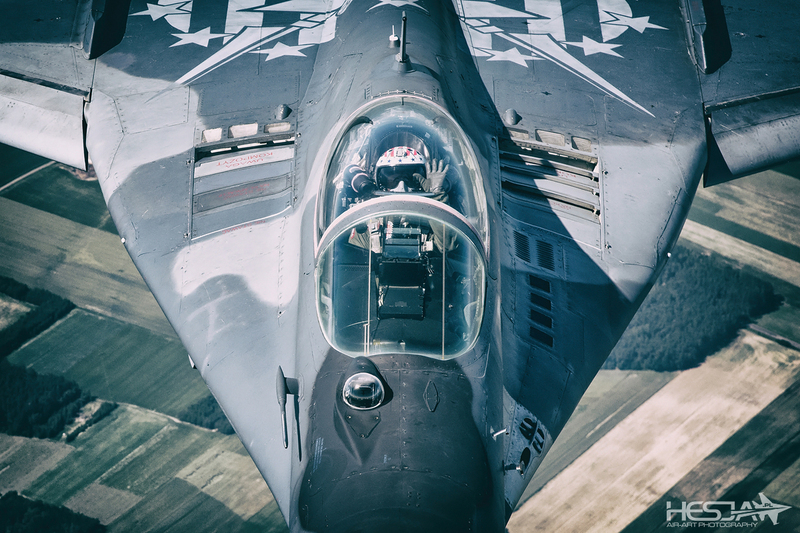 Banked turn is one of the best situations to take photos during the air-to-air photo-shoots. Thanks to this maneuver, we are able to gain an interesting perspective. Moreover, the hot exhaust gases behind the CASA’s engines do not disrupt our shots – they could make them totally blurry. We have very little time to carry out our photo-shoot, since the aircraft are running out of fuel. Fuel consumption ratio is a very significant combat parameter. 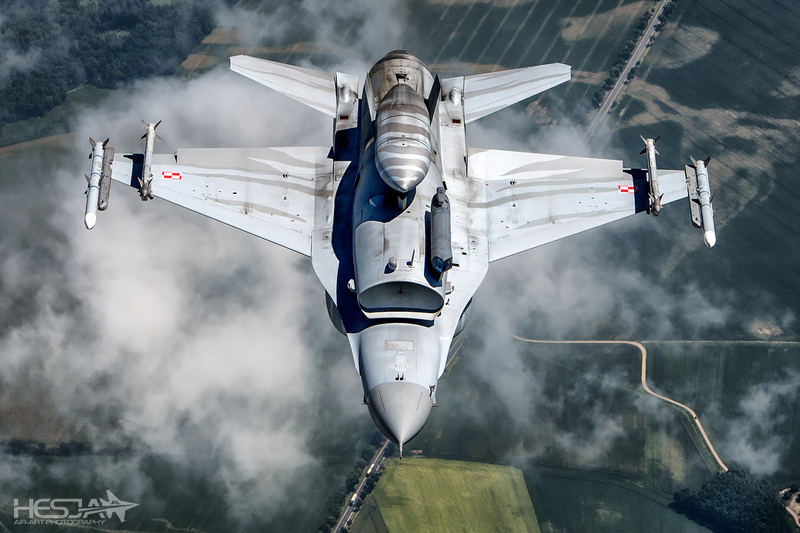 Here, in our trio, F-16 has no competition when it comes to the fuel economy. 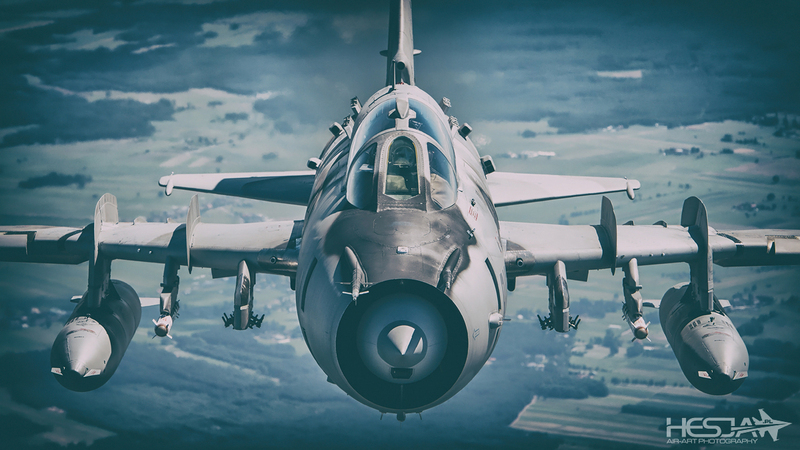 Unfortunately, the Su-22 has lost a lot of fuel during the flight towards us, and as the first one it leaves the formation, flying back to Świdwin. 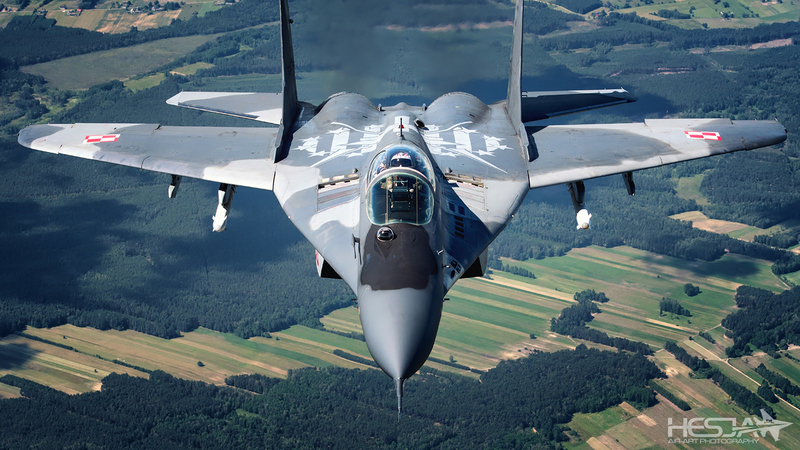 Next, the MiG-29 makes a spectacular break, in order to return to Minsk Mazowiecki. We are left with only one of the actresses, but what an actress she is! 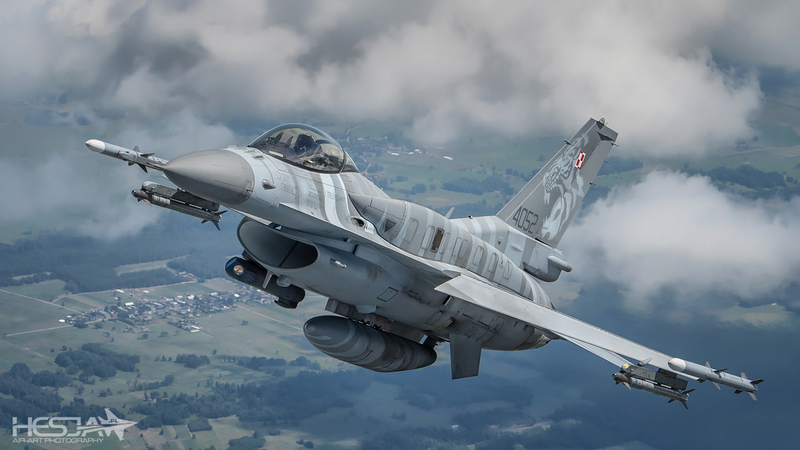 Our national aviation pride – the cult airframe – the Lockheed Martin F-16 Jastrząb jet, which is one of its kind, timeless blend of a beautiful shape and perfection of its combat capabilities. 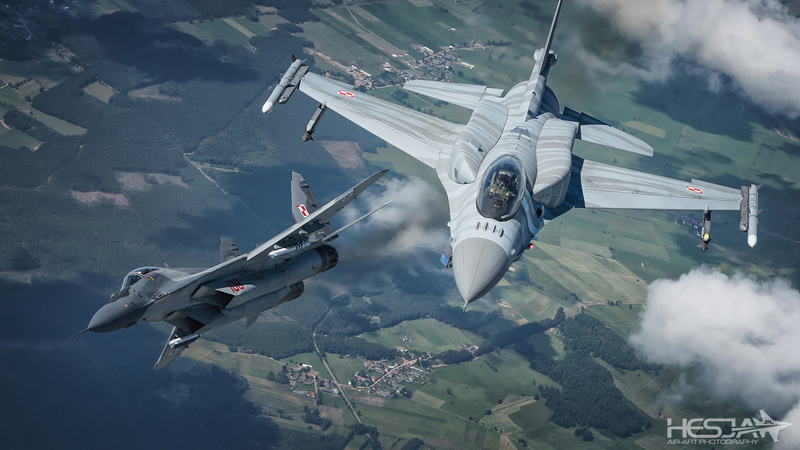 F-16, controlled by Col. Kalinowski, beautifully exhibits its charm in a variety of maneuvers, including inverted and gliding flight. F-16 flies away, while the curtain, formed by the ramp of CASA, falls. It’s been so emotional! I am browsing the photos and looking through them on the displays of my cameras, and I cannot believe what I am seeing! We are on approach to Krzesiny, but the spectacle is still going on. Next Act comes in three hours!